Welcome back! Last time, we started exploring the wild world of pantry pests, what these common pantry pests are, and how to protect your Piedmont home’s kitchen from these annoying (and gross) pests. You may want to read part one of this short blog series to learn more great tips, but here’s a brief recap of the first round of tips. Make sure your windows and screens in your kitchen are properly sealed and free of holes, tears, and gaps where bugs can enter. Organize your pantry so you can easily see if you have an infestation. Clean your pantry regularly to avoid attracting common pests like weevils, moths, beetles, and other pests. 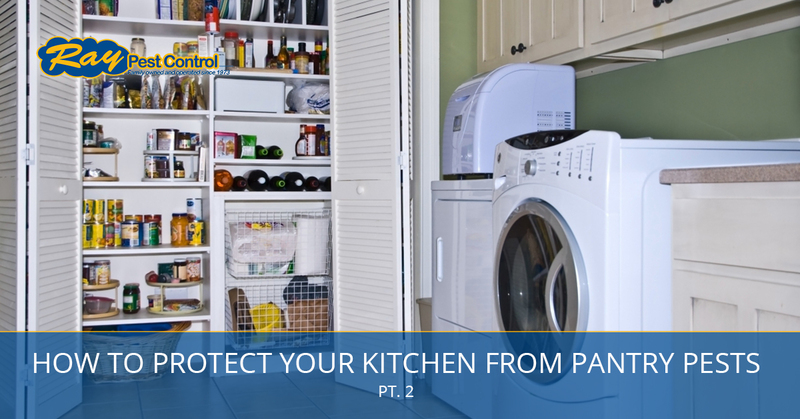 Keep reading below to learn a few more tips for pest-proofing your pantry. Insects are quite smart, despite what we humans commonly think of them, and can make their way into bags and boxes of common pantry goods like rice, cereal, and spices. While many homeowners in Piedmont may think that a nifty chip clip or clothespin pinching a bag of cereal or even chips will keep pesky bugs out, they are totally mistaken. Rather than hoping those nasty pests will stay out of your dry food, you might feel much more reassured if you invest in glass or plastic containers with locking lids that seal airtight to keep the bugs out. Clamp jars are some of the best pantry storage containers because they’re reusable, they lock shut, and are easy to clean. What’s more, if a critter has made its way into your dry food, you’ll probably be able to see it in the clear jar, or at least see where it’s moving if it has burrowed into your food. Tupperware with locking lids is always a solid choice, too. Storing pet food in your kitchen pantry is a major no-no, especially when it is kept in its original bag. Bugs and rodents are drawn to pet food and can chew through pet food bags with no problem at all. Additionally, when pet owners feed their pets, it’s quite common to drop a few pieces of kibble onto the floor, which may or may not get picked up. This is like turning on an “Open for Business” sign to bugs and insects who could be drawn to the pet food, and then make their way into other pantry goods. It’s best to store pet food in an airtight container in the garage, basement, laundry room, or closet away from the kitchen. One sure way to find out if you have pantry pests is to regularly inspect your pantry space. Identifying a bug problem in your pantry is the best way to keep it from getting any worse. As we mentioned last time, keeping your pantry and cupboard clean and organized is an excellent way to see clearly if you have a pest problem. If you notice movement in your dry foods, holes in the packaging of your food, dead bug carcasses, or notice any other signs of bugs or pests, call us immediately so our pest control experts can quickly resolve the problem. These tips should help you protect your kitchen from unwanted pests. Nobody wants gross bugs in their pantry, so if you see any signs of common pantry pests, call Ray Pest Control immediately. As Piedmont’s Top Rated Local® pest control company, we can eliminate your pantry pest issue safely and quickly. Call us today and let us get rid of your pantry pests!